There’s always discontent about how much wireless carriers are trying to rip us off with high prices and ridiculous contracts. Verizon and AT&T are two of the worst offenders, with data sharing plans that end up costing a lot for some users. 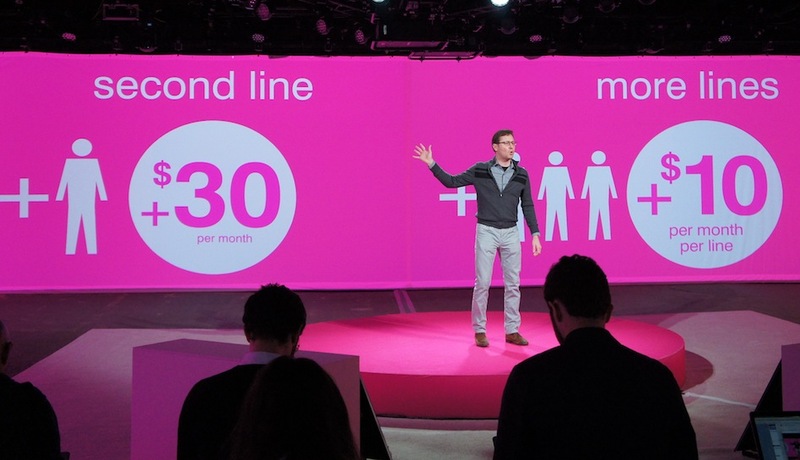 T-Mobile has decided to shake things up and save people money. 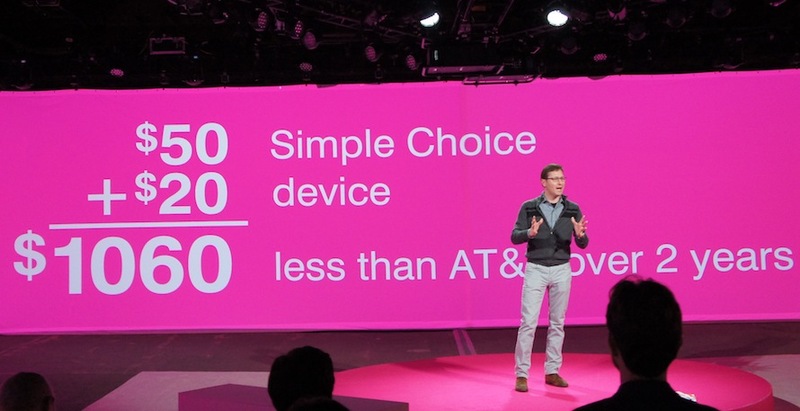 That’s what it promises with its new Simple Choice Plans, a part of its overarching ‘Uncarrier’ brand, announced earlier this year at CES (See: T-Mobile CEO John Legere is crazy). While it’s not as radical as it sounds, and T-Mobile is in fact still a carrier, some of its changes are very welcome. The first step to starting a new relationship with a carrier is always “Getting a phone.” Usually, you look at all of the phones that your carrier sells and pay a subsidized price for the device – a “discount” you’re given because you signed a two-year contract with the carrier. T-Mobile is doing away with that idea. Instead of bundling the price of your phone into your monthly service bill, on T-Mobile you’ll buy your phone separately from your monthly voice/data plan. To buy, say, an iPhone 5, you now pay a down payment of $150, and then pay off the rest in equal monthly installments ($21 per month for 24 months) along with your normal cell phone bill. While you pay more for the phone than you would in the old structure, you end up paying less over the length of ownership because you stop paying for your phone once it’s fully paid off. You can also pay for the entire phone up front, which would cost $650 for the iPhone 5, or you can bring a device from another carrier. Over the course of two years, this ends up being significantly cheaper. If you want to move on before the phone is paid off, you still owe the remaining balance against the cost of the device, as you would to any retailer. T-Mobile says there will be some options to trade a device back in to help pay it off quicker, if you want out now. Aside from the monthly bill that will come for your phone itself, you’ll have to pay for the data you’ll be using on it. Like the Verizon and AT&T restructure that came before, T-Mobile has embraced the idea of making text and talk all unlimited. There are no more minutes caps or specific hours you make your calls in, nor are there restrictions on the amount of texts you can send. For $50 a month, you get unlimited talk and text plus 500MB of data. A second line, consisting of the same plan, costs $30 per month. Each line after that will run $10 each month. If the basic 500MB of data won’t do it for you, a little extra cash will take you a long way. Adding $10 a month will give a line 2GB more (up to a max of 12GB) high-speed data with a mobile hot spot option, or paying $20 more a month will give a line unlimited 4G data. If you opt for unlimited 4G and still want to use it for a hot spot, you get up to 4.5GB for $20. If you’re a single user, this means unlimited everything will cost you $70 a month. This differs from the “pooled” data solution of other carriers, as each line will be responsible for its own amount of data. Though many carriers offer prepaid plans, they’re often only bundled with less attractive phones. T-Mobile is doing away with the difference. All of its devices and all of its plans are prepaid or post-paid. You can choose if you want to pay upfront (or will be forced to if you have poor credit) or if you want to pay at the end of the month. The price is the same. For those on basic phones, options aren’t changing too much. You can still choose the amount of minutes you would like to pay for. This starts at $10 per 30 minutes and runs up to $100 for 1000 minutes. Alternatively, you can get unlimited calls and texts, plus unlimited Web on 2G speed, for $2 a day or the same option, but with 500MB of Web on 4G speed for $3 a day. As another option, you can pay $30 a month for unlimited web and text with 100 minutes of talk time or the same price for 1500 minutes of talk with 30MB of data. To complicate your options a little further, T-Mobile has unveiled Jump! plans. These allow you to pay an extra $10 per month for the right to trade in your existing phone every six months and buy a new one. So you pay the same down payment, monthly fee, and plan fee, but you can pay an extra $10 per month to earn the right, after six months, to trade-in your existing phone and buy another one. Provided you haven’t broken your phone, you’ll then pay the down payment and start again as though you were a new customer. If you can’t go more than six months without wanting a new phone then this could be good news for you, but you’ll certainly end up paying a lot for the privilege. In fact you’ll pay $120 per year for it. Sometimes it’s hard to really get a feel for how these things work without actually applying them, so let’s see what T-Mobile’s new Simple Choice Plan looks like in action. The first step is picking out a new phone. 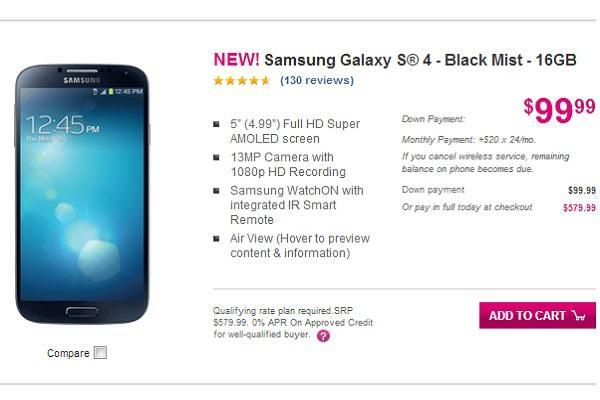 We’re going to go with the popular Samsung Galaxy S4. For comparison’s sake, if we look at the same phone on the Classic plan, we would be paying an additional $20 per month for unlimited 4G data. Stretched over the entirety of 24 months, the Classic plan’s data costs $480 more. You’re still paying the subsidized cost for the phone, likely to be a bit more than a downpayment would be, and you will save $20 a month every month over the 2 year mark as you’ll no longer be paying off the phone. The next closest comparison here from a major service provider is Sprint, which offers everything unlimited for $110 a month. No matter what approach you take, T-Mobile appears to come out on top in affordability with it’s un Uncarrier plan. And keep in mind, T-Mobile isn’t locking you into any contract. It’s entirely month to month. The service itself may be the biggest make or break for you, but the new emphasis on unlimited talk and text, the ability to still have unlimited data, and the fact that you will own your phone outright once you finish paying for it may create enough of an allure to draw people over to T-Mobile and give it a try. Regardless of what you think of cell reception and 4G networks, the numbers don’t lie when it comes to payments: T-Mobile’s Simple Choice Plan comes out ahead. Updated on 7/11/2013 by Simon Hill: Updated text, changed smartphone references and prices to reflect current plans and deals. Added Jump! plan details. Article originally posted on 3/26/2013.